I have had the best day today after a night of disappointment. Last night I went to a football (AFL) to see my team the “Saints” play the “Blues”. It was the first time I have seen a game live in about three years. I was so excited; I didn’t even mind that both Shane and Rachel were going for the other team. Well when we got there our seats were right next to the Blues cheer squad – Oh I really didn’t want to be sitting there. Over the past 12 times these two teams have met the Saints have won every time, but I guess it was Carlton luck on the 13th meeting. They absolutely thrashed the Saints. I tell you I was ready to come home at about half time – Oh well it’s only a game but couldn’t they have waited to loose until I wasn’t at the game. But then today was great – it was “Angel Lunch” day. Today there were seven of us and as always the food at the “Glasshouse” was scrumptious, the company was lovely and the conversation was stimulating and absolutely wonderful. The whole lunch, company and conversation process makes me feel on such a high and so in touch with Davine. I realize now that my “Pilgrimage to Self Discovery in Cairns has taken me to a place where I have made some decisions and I am comfortable with my life, but it has also presented more questions as well. 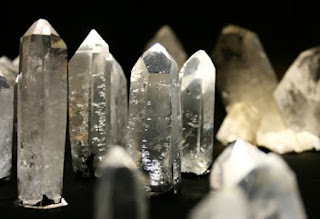 Beautiful Clear Quartz Crystals from “The Crystal Cave”, Atherton Queensland. “Davine Time” update: Today I also did a bit of searching on the internet for some volunteering opportunities. I seem now to have worked out what I want to do to balance my week. Sounds like you have a wonderful life and good friends. It has been interesting to discover that aging is a continuous growing process. There is always a challenge. Good friends sure help. We did have a fabulous lunch, Davine! Thanks for being part of our wonderful group. Lovely to meet up with friends for lunch! Sounds like a perfect day Davine! Sorry to hear that your team lost Davine.